Deepika Padukone Trolled For Pics With Ranbir Kapoor's Cousins. What's Wrong, Internet? Deepika Padukone got pictures clicked with Ranbir Kapoor's cousins Armaan and Adaar Jain at the Padmavati trailer success party. Internet, however, finds the actress 'despo,' 'cheap' and 'drunk'. She was trolled after Aadar Jain (of Qaidi Band) posted a picture with her and one Instagram user commented: "Still despo for RK, deepi, get self-respect." Another Instagram user added: "Didn't like it at all..it looks vulgar to me." 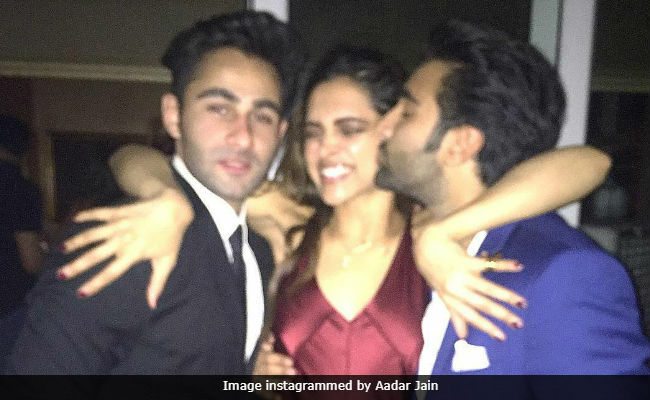 Aadar's brother Armaan, who starred in 2014's Lekar Hum Deewana Dil, shared another picture and this time the social media users trolled Deepika for looking 'drunk.' Words like "She is totally drunk and looking so weird" were posted in the comments feed of the picture. Aadar and Armaan Jain are sons of Ranbir Kapoor's aunt Reema Jain (Rishi Kapoor's sister). And of course, everyone knows that Ranbir Kapoor and Deepika Padukone dated a long time ago. Post their break-up, Ranbir and Deepika have made two films - Yeh Jawaani Hai Deewani and Tamasha - together. Deepika Padukone hosted a party over the weekend to celebrate the success of the trailer of Padmavati. Shah Rukh Khan and his wife Gauri, Ranveer Singh, Karan Johar, Sara Ali Khan, Jhanvi Kapoor, Abhishek Bachchan, Kriti Sanon, Athiya Shetty and Manish Malhotra were in attendance. Several inside pictures made its way to the social media on Sunday. The young ones! The star one and the me! Padmavati is directed by Sanjay Leela Bhansali and it also stars Shahid Kapoor in lead role. The film is expected to hit the screens on December 1.